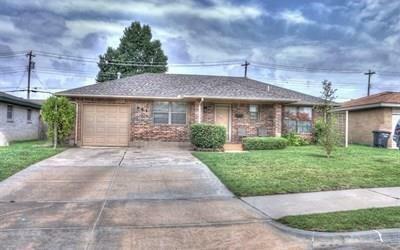 Affordable, move-in ready, newer home in Moore school district!!! The home is located across the street from the elementary school and is also within walking distance from the junior high school!!! Perfect home for first time home buyer, or for anyone who wants to down-size!!! The roof, the fence, the outbuilding in the backyard and the covered patio are two years old!!! Good size, fenced in backyard!!! Great location, close to shopping, entertainment, hospital and I 35!!! Come and see before it is SOLD!!!! No showings before the OPEN HOUSE at 2:00 pm on Sunday August 19th. There will be an Estate Sale on Friday and Saturday though, so you are welcome to stop by then, for a pre-view.